The Horned Frogs enter the 2018 season looking to continue the momentum from their deep postseason run last spring with a roster that is both experienced and physical. Led by head coach Raegan Pebley, TCU returns all five of the starters that compiled 23 wins and a semifinal appearance in the WNIT. Sophomore Lauren Heard and juniors Jayde Woods and Kianna Ray will anchor the backcourt, while seniors Amy Okonkwo and Jordan Moore will lead the frontcourt. Both Okonkwo and Moore averaged double-digit points last season and both come into their senior seasons with high expectations. 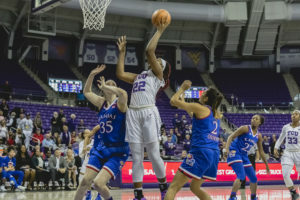 Okonkwo was named preseason Big 12 All-Conference and Moore was placed on the Lisa Leslie Award watch list, which recognizes the nation’s best center. The team will look to their physicality as they compete in a Big 12 conference headlined by its size. Baylor’s Kalani Brown, the conference’s preseason player of the year, stands at 6”5’ and averaged 20.1 PPG last season. The Bears also boast 6”4’ junior Lauren Cox and Texas’ Charli Collier was named the Newcomer of the Year standing at 6”5’. “The Big 12 is a league that whatever teams post players aren’t in foul trouble, you got a chance to win,” Pebley said. Along with eight returning players, the Horned Frogs welcomed four first-year players and two transfers in the offseason. 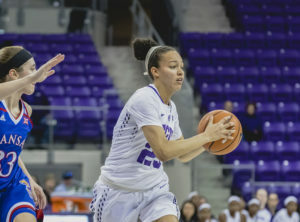 The team’s only loss outside of graduating seniors Toree Thompson and Sydney Coleman was junior guard Amber Ramirez, who transferred to Arkansas. The incoming class includes post players Becky Obinma and Yummy Morris, who Pebley hopes will add depth and length off of the bench. Both stand at 6”3’. Senior South Dakota transfer Jaycee Bradley will have to sit out a year due to NCAA rules but sophomore Oregon transfer Anneli Maley will be immediately eligible. Maley, an Australian native, is a 6”2’ guard/forward combo that will add a versatility and tenacity to the team. 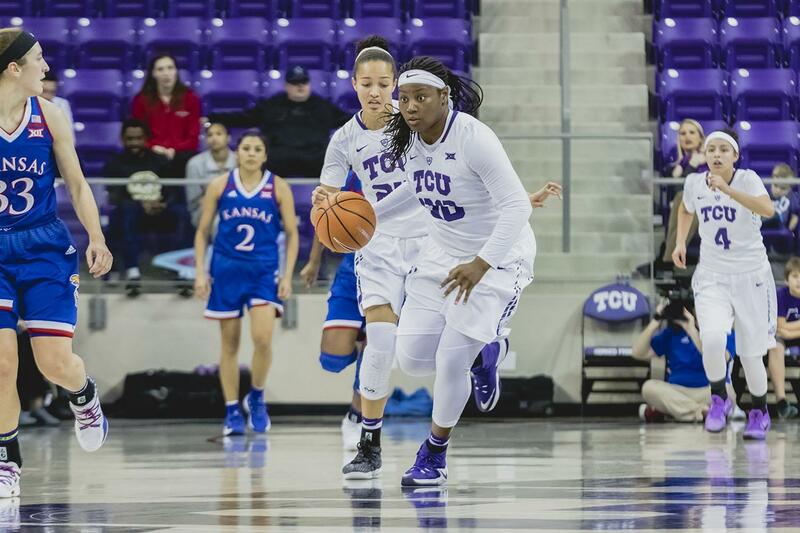 Pebley said that she will increase TCU’s defensive depth with her ability to guard both guards and forwards. The team will also look to Maley to force turnovers and play smart, two tenants of any good team. The Horned Frogs will begin their season tomorrow against Duquesne, a team projected to win the Atlantic 10 Conference. The Dukes have four players on the conference’s preseason team and will provide a tough first test for the Horned Frogs. Pebley said they wanted to improve their strength of schedule this season in order to improve their RPI, a metric used when selecting teams for the NCAA tournament in the spring. Tip-off for the 2018-19 season is set for noon at the Schollmaier Arena.